Truly wireless power delivery has been a dream for basically a century now, and it’s coming to fruition in the strangest of places, like Nintendo Switch controllers. 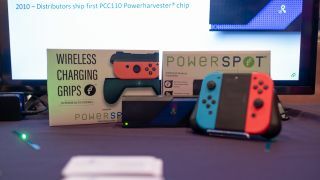 At CES 2019, a company called Powercast has debuted a range of products designed to wirelessly charge your Switch Joy-Con controllers over the air. Here’s how it works: players connect one of Powercast’s new Powerspot wireless power transmitters to an outlet. This transmitter then creates a short field of radio frequency (RF) around itself – in this case up to two feet, but Powercast claims it can broadcast up to 80 feet of RF with the Powerspot. Finally, you attach a either a single Nintendo Switch Joy-Con controller to a horizontal grip or two Joy-Cons to a more traditional grip accessory that looks a lot like the one included in the Nintendo Switch box. However, here’s the difference: these grip accessories contain a Powercast development known as the Powerharvester receiver as well as an additional battery. When within two feet of the transmitter, the controller grip will automatically charge by converting that RF field into DC power, topping off the Joy-Con(s) within as it goes. With this method, Powercast promises up to 38 hours of use from your Joy-Con controllers when attached. Of course, an LED on the grips illuminates both when it first begins wirelessly charging and when it’s topped off. It’s odd to see one of the first consumer applications of truly wireless charging in something as inconspicuous as dinky video game controllers. But, perhaps that’s the necessary proving ground for such a groundbreaking technology. While we would have loved to have been able to play with Powercast’s Joy-Con grips while they’re charging, we’ll take this baby step toward that dream. The true power of this development is that the Powerspot product is completely agnostic to whatever it delivers power to, allowing Powercast to develop any number of products in tandem with it, all within the Powerspot’s 80-foot theoretical range of RF field transmission. It’s currently unknown how much the Powerspot and its accompanying Nintendo Switch Joy-Con charging grips will cost. However, Powercast is aiming for a Q3 2019 (between July and September) release for all three products, which will be bundled as well as sold separately.